On a basketball team, only a few guys get the offensive touches they would want. While a couple players get to handle the ball and dictate the offense as they please, the rest are at their mercy, both in terms of whether they get the ball or if the offensive set is even run. Ideally, a team features a selfless player or two, one who doesn't look to score or can operate without the ball in their hands. Not everyone can put together a five-man "Death Lineup" like the Warriors where all five players are interchangeable. In short, teams are looking for a glue guy. They're looking for Ed Davis. In his first year in Brooklyn, Davis has made an immediate impact as the team's backup center. Although he won't turn 30 until June, he is a journeyman compared to the rest of the young Nets roster. The 6-foot-10 forward is on his fifth team after spending three years in Portland. To no surprise, his teammates loved Davis in Portland. Heck, they've loved him everywhere dating back to his college days at North Carolina. Earlier this season, CBS Sports' James Herbert spoke with a smattering of players who raved about Davis' work ethic and support in the locker room. And that has extended to Brooklyn. D'Angelo Russell singled out Davis after a strong game last month and he's hardly the only Net to speak to his impact. "Just seeing Ed out there, he fights for every rebound -- offensively, defensively," Jarrett Allen said of Davis. "He gave a spark for everybody, including me." Davis fulfills the Nets' need for the bandied-about veteran presence, but that presence only goes so far without on-court production. It's one thing for Allen to hear what he needs to do to become the center he wants to be; It's another thing for Davis to show him every minute Allen is off the court. In just 18.2 minutes per game, Davis averages 5.9 points and 8.6 rebounds while making 62.1 percent of his shots from the field. His 62.9 true shooting percentage is third on the team. When you take his rate stats, however, Davis goes from a solid backup to a driver of the Nets' success. He posts up 11.6 points and 17.0 rebounds per 36 minutes. With a 105.6 offensive rating and 101.3 defensive rating, he leads the Nets with a 4.3 net rating. The 6-foot-10 center makes his money on the boards. He's second in basketball behind Andre Drummond with a 16.3 percent offensive rebounding rate while reeling in over a third of the potential defensive rebounds when he's on the floor. Kenny Atkinson clearly sees his value. Alhough he gives Allen most of the minutes at center, he isn't afraid to leave Davis in for crucial stretches and play him over Allen in certain matchups. While Allen continues to grow, Davis remains steadily productive. "It's the rebounding. It's his toughness," Atkinson told HoopsHype. "It's his presence around the team. He coaches those young guys. He was a fantastic addition." He's saved some of his better games for 2019. Since Jan. 9, Davis has hauled in a season-high 16 rebounds in four different games. Three of his four double-doubles this season have come in under 21 minutes of playing time, an impressive display of efficiency. 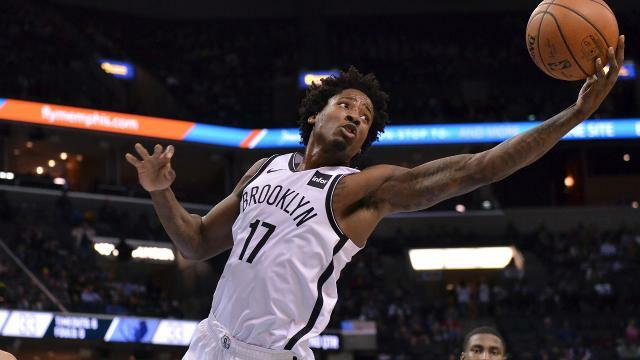 The 2017-18 Nets were missing a lot more than just a strong backup center, but Davis plugs a lot of holes for a steadily improving Brooklyn squad. He's not a playmaker. You're not going to give him the ball and tell him to get you a basket. Instead, Davis does all the dirty work, which has allowed the Nets to reach new heights this season.